At home and at work in Texas with Folk Fibers. Maura Grace Ambrose knows the difference between simple and easy. Maura started quilting and studying its American folklore at Savannah College of Art & Design, where she graduated with a degree in textile design and fiber arts. She’d go on to land corporate creative gigs at Urban Outfitters, teach at preschools, and hone an organic gardening education with apprenticeships at sustainable farms and greenhouses. Yet in 2011, Maura found herself unsettled and seeking to reconnect with her artistic roots. Thus, a four-month sojourn crisscrossing the back roads of America with her husband in a 1970 Volkswagen van began. (“The camper literally couldn’t run on highways so we had to take the long way.”) Throughout the trip, Maura worked on her first lap-stitched quilt, documenting her progress and mileage on social media. The adventure along the Mississippi and across the Appalachians lit a fre within the Ambroses and from then Maura resolved to pursue quilt making full time. Within months, she amassed a huge online following and attracted influential collaborators, like Levi’s who commissioned the first batch of Folk Fibers quilts for their flagship stores and nationwide Makers campaign. “It’s crazy to think how things took off,” she says about the momentum of the brand’s early days. Rooted in the slow art of natural dyeing and abstract Americana and Amish designs of the 19th century, Folk Fibers seemed to catch a resurgent wave of modern craftsmanship. In 2013, they were one of 10 businesses honored with a coveted Martha Stewart American Made award. The next year, Folk Fibers made record sales and Maura and Chap welcomed their first child, Ada Mae. 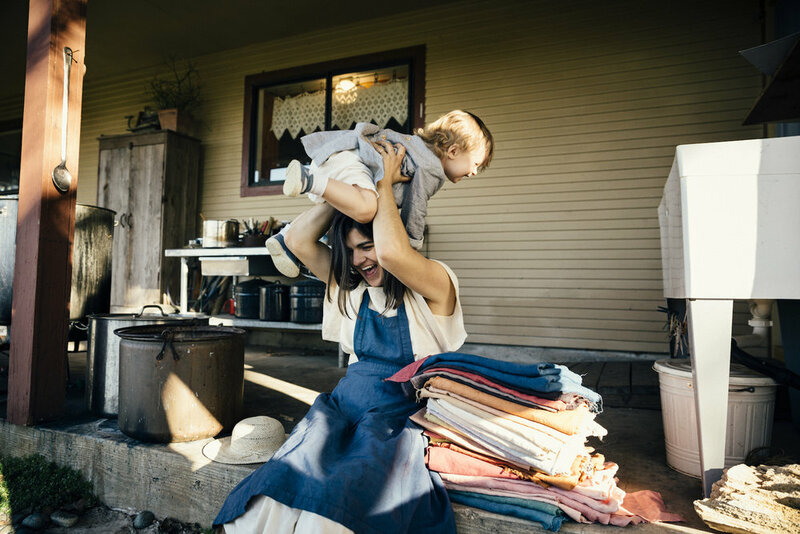 The couple bought their family’s first home in the Texas Hill Country soon after and relocated the Folk Fibers headquarters there, about 30 minutes outside of Austin. The 10-acre homestead occupies a beautiful tract of hilltop property with sweeping views of neighboring forests, farmland, and cattle pastures. Ada, almost two years old now, runs between the raised beds of their new organic garden where I stand with Maura, talking about how indigofera tentoria is different from her other dye plants. She describes the payoff in loose terms, like her ability to strike out whenever she pleases into the countryside to forage dye materials: the yellow leaves of Mexican plum trees, juniper berries and the cochineal insects, the inner bark off collapsed black oak trees, or the mustang grapes she waits for every July. Ada darts ahead of us, showing off a pair of puddle-splashed sneakers and throwing back her hay colored curls in a ft of giggles. A wind whips up from the hillside, lifting up a fresh breeze from the tops of trees and wildflowers that only Maura could identify. The setting is idyllic, almost anachronistic in its beauty, like one of her hand-stitched heirlooms—and just as deceptive in its appearance.